Maintaining a car can be expensive. The cost of repair work or replacement of parts can also vary based on the make and model of a car. In addition to the usual wear and tear, which can be kept to a minimum if routine servicing is carried out, there are certain repairs which can prove to be costly. Unless a specific part is under warranty, fixing or replacing parts can easily blow a hole through your budget when you least expect it. 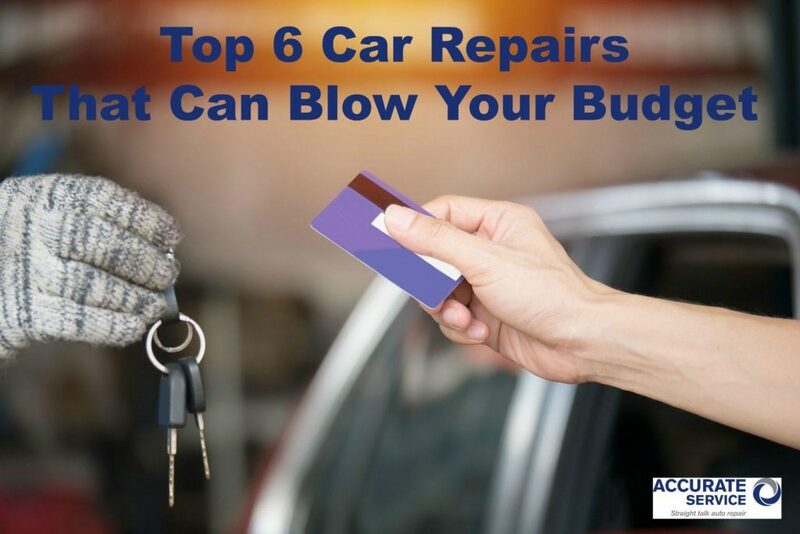 Here are the top 6 car repairs that cost the most. Cylinders – Major Engine Trouble! Engine damage which requires the cylinders to be replaced takes the top spot when it comes to expensive car repairs. Anytime your engine sustains damage which involves the cylinders, especially if you drive an SUV or truck, just spells bad news. You would be better off simply replacing the entire engine as opposed to any kind of repair work on the cylinders. If your car transmission is damaged, it will impact how the wheels function. The power from the engine is transferred to the driveshaft through the transmission. Because the entire structure is complex with a number of components running in tandem to ensure the running of the car, the wear and tear is far more extensive because of the friction and heat generated. Watch out for signs which include a burning smell, a dragging clutch, or gears slipping. These could be the first signs of trouble so get your car to the mechanic as soon as possible. And if your mechanic is Michael Kelso from That 70s Show you may want to find another mechanic! Once the airbags in your car are deployed, they will have to be replaced. Air bags are critical to saving lives but the fact is anytime they are deployed, it messes up the front section of your car. You could also be looking at costs involving the replacement of the glove compartment and the steering wheel among other components if the air bags were deployed due to an accident. Even if the air bags were deployed in a freak (non-vehicle crash) accident, you will have to replace the air bags which can be a costly affair. The suspension system of your car is again a complex structure, but crucial as the system is responsible for absorbing the shocks and bumps of the surface. It consists of several parts which include the springs, the tie rods, the shock absorbers, the control arms, and the struts. Any damage to individual parts will not cost much and can be easily carried out. However, if the entire suspension system has sustained damage, it will need to be completely replaced, which is expensive. The job of the camshaft is to control the air intake cylinder valves and the exhaust valves. Over a period of time debris or dust gets collected along the camshaft which could hamper it’s functioning or even damage it. The best way to avoid damage to the camshaft is by routine cleaning. However, if you are not regular with changing the oil or routine cleaning of the valves and tune-ups, the damage to the camshaft could be extensive and require replacement. Also, keep in mind this is a labor-intensive job which is why you could be in for a rude shock when the bill arrives! And no, your mechanic probably won’t sound or look like Mikaela Banes from Transformers 2 even though Mikaela works in a mechanic shop. The batteries in a hybrid car are expensive which means replacing them is not going to come cheap. Although hybrid cars are popular because they are considered eco-friendly, the fact that they come with hidden costs is a huge disadvantage. The jump in costs between replacing the battery of a conventional car model ($150-$200) and a hybrid car ($6,000) is simply too huge. Another important factor to keep in mind here is that hybrid batteries, just as in the case of regular batteries, lose their charge over time. Furthermore, in addition to replacing the battery, you could also be looking at charges for replacing the computer system of the car as well.